Did some door knocking today in my IBC ward (St Johns). This isn't going to get me into Westminster but it's important to speak to my existing constituents and help my friends and colleagues with their campaigning. It was good to meet a resident that had just been helped by Chris - it is always pleasing to see politics get a result. The main issue we picked up was lack of affordable and council housing. It was good to hear Gordon Brown say in the budget that £1.5bn per year is to be made available to build 10,000 more affordable homes. Unfortunately, it will be some time before the houses are a reality. The happy gang then retired to the Golden Key for a pint and a discussion on the issues of the day. Went along to a session at Ipswich Hospital this afternoon. It's not in the constituency but it's the main hospital for the constituency. I am a strong believer in the NHS but I have some concerns about Ipswich Hospital. The problems with capacity will not be sorted until the new Garrett Anderson centre is built and open, probably in 2007. I'll have to get by with pictures and promises for the campaign! The hospital is also doing more to involve patients and the patient's family in the care of the patient such as when nurse shifts change the changeover is done with the patient and not in the office. These all sound like good initiatives but I suspect they will get a big test in the winter. Went to an open evening for the Iceni project in Ipswich. The Iceni Project is a charitable trust based in Ipswich but takes clients from all over Suffolk. Staff at the Project Centre, provide care, support and advice to those in the local community whose lives have been affected directly or indirectly by the misuse of drugs. They offer a free intensive support programme to anyone who shows a genuine desire to stop using drugs. They take a holistic approach and use techniques like group therapy, aromatherapy, acupuncture and anger management to help "clients" with their drug problems. This is different to the conventional approach which uses more medical techniques. Iceni is providing a valuable service for people with big problems. All power to their elbow. Tuesday - Telephone canvassing. Spoke to several residents and picked up a few issues. Have already sorted two and another may be fixed soon. Thurs - Was at a reception for UCS - University Campus Suffolk - an exiting new University proposal for Suffolk. I then rushed off to the AGM of Suffolk ACRE which helps voluntary and community groups throughout rural Suffolk. Both UCS and ACRE will help improve the quality of life in this area - I'll write more about them another time. Friday - I attended Officers and then Members meeting of the Central Suffolk and North Ipswich Labour Party. Some useful discussions as I went through my campaign strategy. Saturday - Public meeting in Whitehouse about Stock Options. A few people came along but even they complained about the apathy of people on the estate. Sunday - worked on words for website. Tired out and am off to Reading with work for two days. Spent thursday and friday evening leafletting around the Whitton council estate in Ipswich. In preparation for a public drop-in session on the future of council housing in Ipswich on the Saturday. Lots of kids on the estate - much more lively than East Ipswich! THe kids I spoke to were very polite. Ipswich Borough Council - and also Mid-Suffolk DC - are running Stock Options consultations over the next year. It should be an issue in the council estates. The consultation is about whether the council remains the landlord or the housing stock is transfered to an ALMO (Arms Length Management Company - a housing trust affiliated to the council) or a Social Housing organisation. The aim of the process is to come up with a financial structure and timescale to meet the "Decent Homes" standard for housing. I am very keen to see Decent Homes met because decent people need decent homes. Attended the North Ipswich branch meeting as I am their general election candidate. I went through my campaign plan, which was pretty well received. The most controversy came over suggestions around banning smoking and MRSA. Interesting discussion with David, who runs a small engineering business. He said he couldn't afford to have apprentices under the Tories as it cost £3500 to send them to college. Under Labour, it is free. If its Monday, it must be a meeting of the Ipswich Borough Council Labour Group. Unfortunately we hear that the Lib-dems are not going to support the Labour administration, which means we will be in opposition come the next full council meeting on 15th September. So its off down the Black Horse for a pint in the "beer garden" or car park. Good discussion on campaigning with John Cook, the Ipswich agent. 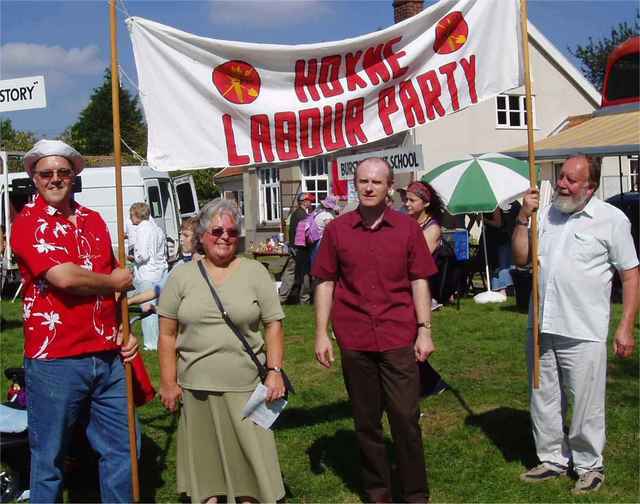 Attended the Burston Rally today, at the invitation of Hoxne Labour branch. Its a Trade Union festival to celebrate a school strike that started in 1914. See http://www.burstonstrikeschool.org/ for more details. Part of the rally is marching around the village - the shape of the road network on the map looks like a candlestick. Doesn't look like any candlestick I've seen! The speakers included Jeremy Corbyn MP for Islington. He made good points about preventing worker exploitation and his fear of a second term for George W Bush. It was good to speak to the Hoxne branch and had a long converation about teaching. Also spoke to Richard Howitt MEP about some of the things he is doing around his constituency and also caught up with former mayor of Ipswich, Maureen Carrington-Brown, who has retired to the country! I also accepted an invitation to speak at the Agricultural Workers Union (part of the TGWU) Regional conference.